A girl finds herself in a fantasy world. She meets Ping and Pong, and they travel together. Come and join them on this journey without words, into a world made of colorful ping pong balls. 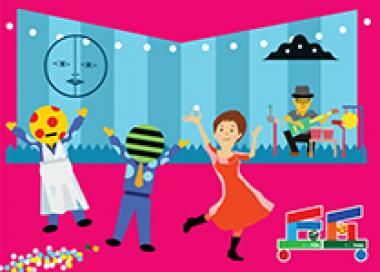 Sato Makoto, director of Za-Koenji Public Theatre, and the illustration duo, tupera tupera come together in creating a simple, heart-warming theatre experience. To wander into a strange world of adventure is the dream of many children. What if ping-pong balls were alive? Children are invited to free their imagination, and share the warmth of family, the importance of friendship, and the joys of living. 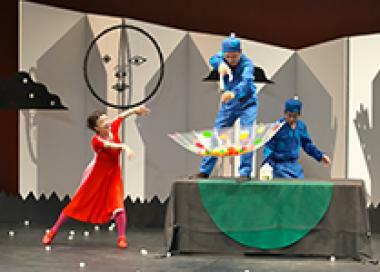 Colorful ping-pong balls jumping all over stage, live music that doubles the fun, delightful songs that invite the audience to join in, and breathtaking dances, all come together to release the child’s imagery. The play is fun for families to watch together, and recommend for a child’s first theatre experience. “Kindness” and “Sympathy” are illustrated through a simple story. Every day things that surround the child, such as ping-pong balls, spoons, hair dryers, and umbrellas are used to tell the story, which enhances the child’s imagination, introducing them to the magic of theatre.